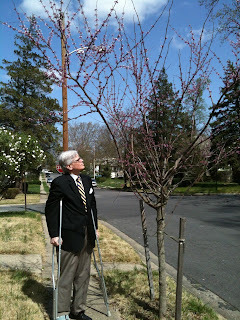 In 2008, at our request, the city planted a redbud tree in the tree lawn in front of our house. It was a little taller than I was. The winter of 2009, you will recall, was a hard one, and in the spring only a few branches budded, most of them appearing to be dead. The spring and summer of 2009 were also a time when my career appeared to be dead, or at least moribund. Having been laid off by The Sun, I was fruitlessly applying for other jobs and scratching around for freelance work. At loose ends on many days, I spent time trying to revive the faltering redbud, watering it nearly every day and fertilizing it at intervals. It produced some leaves, and I was encouraged to hope for it. The following summer, when The Sun hired me back as night content production manager, the tree budded more vigorously and put out new branches. I pruned most of the dead ones and kept up the watering and fertilizing. Today, as it blossoms again, I can say that my career, such as it is, continues, and during my hiatus one substantial thing that I accomplished was to keep a tree alive. Memorial Episcopal Church publishes a series of Lenten meditations by members of the parish. I was invited to contribute this year but, distracted and preoccupied by other matters, missed the deadline. Now, to stop ruminations from rolling around in my head, I offer them to you. In Lent we are invited, encouraged, and exhorted to engage in self-examination, which is a healthy enough thing to do, but which can easily lead us astray. In introspection we may wind up dwelling on the pains of the past: the injuries we have done to others, the wounds we have suffered that still ache, the actions we have failed to take, and the defects of our character that stubbornly persist throughout our lifetimes. Introspection can mire us, and the more we reflect on our failures, our hurts, and our limitations, the less we may be able to extricate ourselves, the more we may feel powerless. I'd like to suggest that after a little self-examination, it might be better to consider actions. For many people, the main action in Lent is to give something up: red meat, liquor, desserts, caffeine, cigars, whatnot. How about, instead, giving up something from the past that is beyond remedy? Those love letters from a failed romance? Recycle them into pulp. The same with that letter of rejection for a job you sought. Mark something over and done with in your mind, and rid yourself of the physical manifestation. Another action is to make something right. Make an apology to that person you injured. You may not be forgiven. Or give up on the resentment of someone who injured you. Cast your mind on what you might yet do instead of what you have done or failed to do. As Paul Writes to the Philippians, "forgetting what is behind me, and reaching out for that which lies ahead, I press towards the goal." Some of this might be good for us corporately as well. As much as we honor our history and our identity as a denomination, a diocese, or a parish, it is better to live in the present and press toward the future than to live in the past. Reflecting too much on our past glories that have faded, or focusing on past failures and resentments, will not get us where we wish to go.